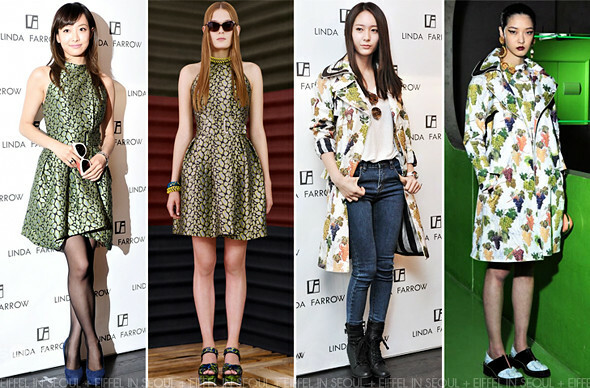 Victoria (빅토리아) and Krystal (크리스탈) of f(x) attended the media launch of Linda Farrow Spring/Summer 2013 collection held on February 21, 2013 in Seoul, South Korea. Both of them were seen wearing frocks from Kenzo. Victoria (빅토리아) wore a clouded leopard jacquard dress from Kenzo Resort 2013 collection. A pair of black sheer tights and navy suede pumps to accessorize her look. Krystal (크리스탈) opted for a more casual style with a simple tank, denim jeans and Kenzo marble grapes printed coat from Fall/Winter 2013. A pair of Linda Farrow for Jeremy Scott glasses and black boots to complete her look. While I love Victoria (빅토리아)'s dress, the styling of Krystal (크리스탈)'s outfit made her look much more attractive.